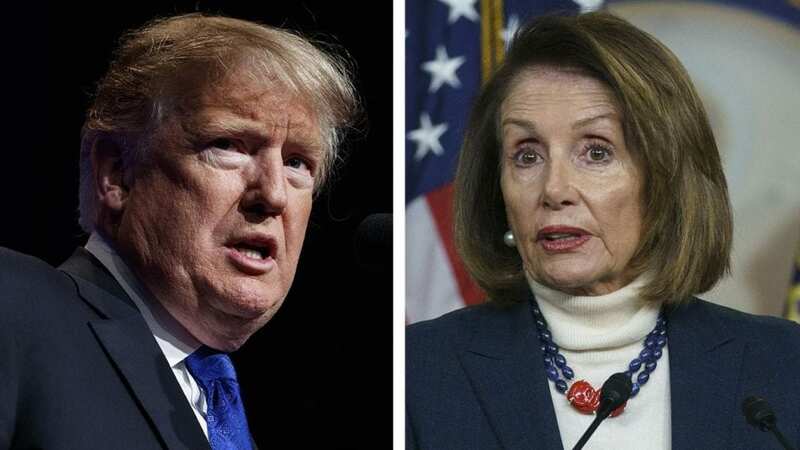 President Trump on Monday challenged House Speaker Nancy Pelosi, who has called the White House’s proposed southern border wall “an immorality,” to explain why she is not insisting on the removal of existing physical barriers, or opposing ongoing construction of new wall projects near San Diego, Calif.
Trump, in a follow-up tweet, asserted that the country needs a “powerful Wall” to deter the incoming migrant caravan that marched freely through the Guatemala-Mexico border last Friday, after the gates were left wide open by officials seeking to avoid a confrontation. The caravan, which consists of approximately 1,000 Central American migrants, was among two groups that “broke into Mexico and are headed our way,” Trump said. Pelosi did not immediately respond. On Sunday, Trump charged that Pelosi — who has not called for destroying existing walls — “is so petrified of the ‘lefties’ in her party that she has lost control” and is now behaving “irrationally” as a result. The San Diego Union-Tribune has reported that physical barriers, including walling and fencing, encompass approximately 46 miles of the city’s 60-mile border shared with Mexico. In February, construction is slated to begin on approximately 14 miles of additional secondary walling, with work to begin on 15 miles of replacement wall this summer. However, Vargas insisted, the White House’s demand for more border wall funding — which has led to a legislative impasse and the ongoing partial federal government shutdown — is unnecessary. Trump on Saturday unveiled a plan to offer several immigration-related concessions to Democrats in order to obtain $5.7 billion in funding for a wall. The president offered Democrats a three-year extension of protections for 700,000 Deferred Action for Childhood Arrivals (DACA) recipients. The offer also would extend protections for 300,000 recipients of the Temporary Protected Status (TPS) program — which protects immigrants from designated countries with conditions that prevent nationals from returning safely. Nevertheless, some high-ranking Democrats signaled that, like Vargas, they remained open to walls in some areas. House Majority Leader Steny Hoyer, D-Md., appeared to side with Thompson’s position last Wednesday on Fox News’ “Special Report with Bret Baier,” arguing that border walls “obviously” work in some areas and rejecting suggestions that barriers should be removed where they already exist. Democratic leaders previously have supported building border walls. Senate Minority Leader Chuck Schumer, D-N.Y., and other Democrats, including then-Sens. Barack Obama and Hillary Clinton, supported the Secure Fence Act of 2006, which authorized the construction of some 700 miles of fencing at the border. As of 2015, virtually all of that fencing had been completed, according to government figures. Border Patrol officials also have said that walls are effective. “We certainly do need a wall. Talk to any border agent and they will tell you that,” Border Patrol Chief Carla Provost said on Fox News’ “Your World” last month.